Hood Construction provides onsite consultation services for soundproofing as well as general building and design. We aim to help with a wealth of knowledge and expert advice for even the most demanding situations. We have consulted on offices, schools, gyms, restaurants, bars, residential spaces, commercial buildings, listening rooms, as well as a variety of recording and performance environments. To get started, please email us and let us know about your project, and we can set up an appointment as soon as possible. At Sennheiser’s Flagship store at Union Square in San Fransisco, they needed the ability to close off an office space from the busy sales floor. Designing a new office conference phone, they required a quiet and echo free environment which to test their new system. Modern aesthetics in commercial spaces offer little relief when it comes to noise and echo’s. 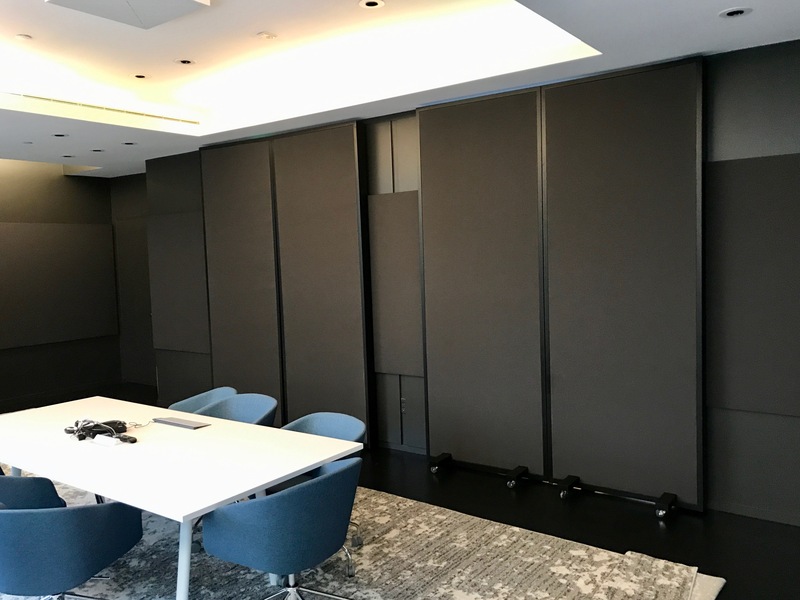 After we consulted with Sennheiser about their needs, we designed and fabricated the full height (over 9 foot) rolling partitions. They smoothly roll away and store against adjacent walls when not in use. The results are an easily convertible space that sounds great. 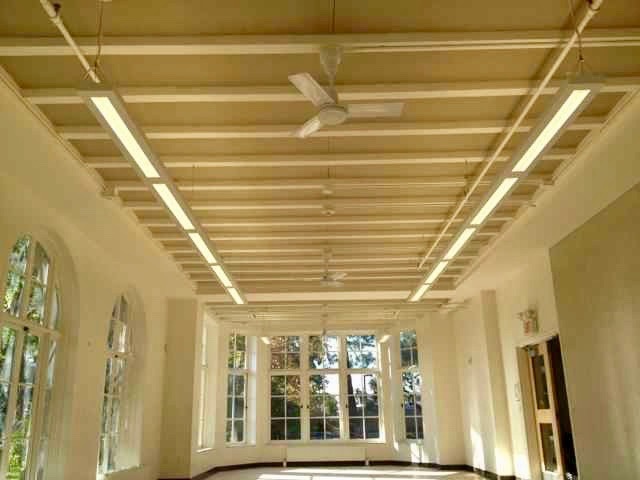 Park Day School in Oakland uses their large and beautiful multi purpose room for anything from performances, dance classes, music classes, to school and community functions. Due to the size of their hall, the parallel hard surfaces and lots of glass, the sound was anything but pleasing. The long reverberation time (the time it takes for sound to fade, similar to an echo) interfered with visitors’ ability to understand each other and increased the overall perceived noise level of the space. After consulting with their staff and considering ergonomics and aesthetics, we concluded the most logical approach was to treat the concrete ceiling. 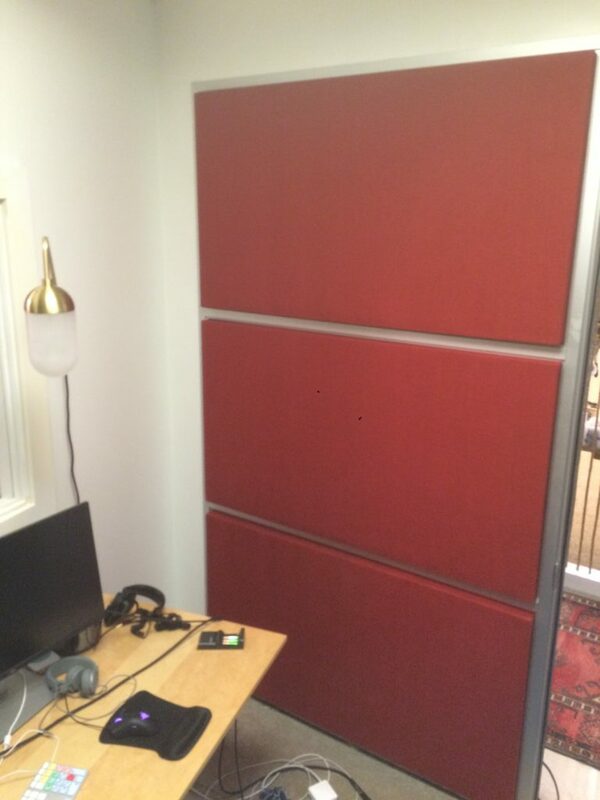 Installing custom designed sound absorbing panels, dramatically decreased the reverb time and reduced the flutter echo’s that plagued the space for years. The results are a much tighter sounding space. Intellagable speech has improved, as well as the overall sound of the space for performances. The teachers rejoiced! Detour is a software startup company focusing on phone based applications for walking tours. They require simple, in office recording of spoken word. After consulting with their lead audio engineer, we developed ways to convert simple office cubical partition rooms into small but usable recording spaces. A combination of wall surface changes, acoustic insulation, ventilation upgrades, door seals, and uniquely designed sound absorbing panels, (that fit into aluminum grid windows) we made a space that works for their needs.